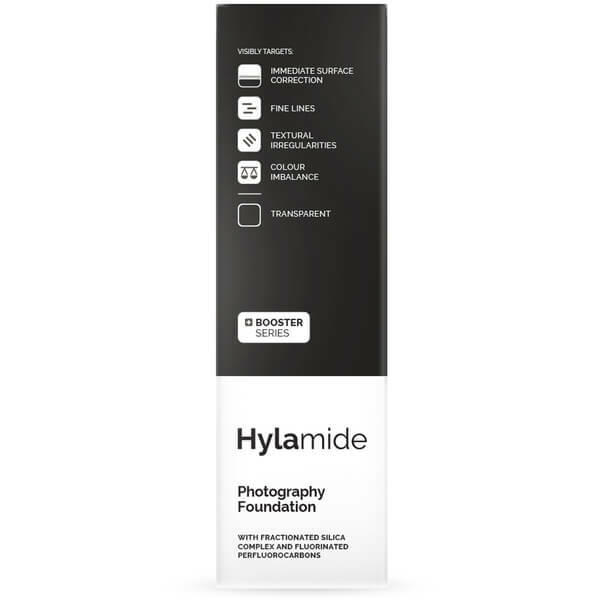 Be camera ready with Hylamide's Photography Foundation in 'Transparent', a non-tinted, skin-perfecting formula designed to improve skin's appearance for the camera lens whilst blurring away imperfections in real life. Wear alone for a sheer, dewy finish, or use as a primer beneath your normal foundation for an enhanced, illuminated complexion. Infused with nano-fractions of silica-based prisms that create light confusion for a blurred effect, the low-coverage foundation helps immediately correct tone whilst camouflaging fine lines and pores, and expertly highlights your best features for a show stopping look through the lens. 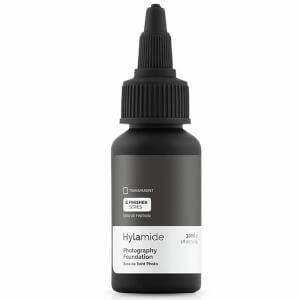 Its oil-free biotechnology keeps skin comfortably hydrated for 48 hours, and a host of prismatic hue correctors counteract unwanted tones whilst creating angular shadows for definition on camera. Skin looks flawless on photographs and perfectly balanced in real life. Apply after the last step in your skincare routine (moisturising). Wear alone or as a primer before usual makeup.